Generations of Faith is a new approach to faith formation that is life long and intergenerational. It is intended to serve the whole parish–children, teens, college students, young adults, single adults, parents, grandparents, elders–as everyone learns and grows together. 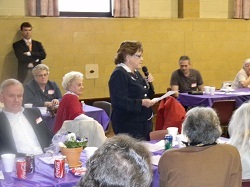 I would like to extend my thanks to the planning committee and speakers for helping to organize this program in our parish on Sunday, April 3rd, 2011. 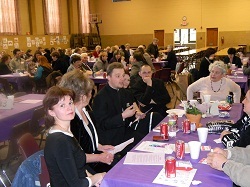 Over 100 people have gathered after the Sunday Liturgy in the school hall to learn of how to become a better Christian by integrating faith, worship, and life in light of the Gospel during the Lenten season. 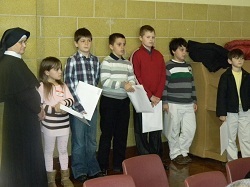 A special thanks go Mrs. Helen Cheloc for preparing the presentation on the topic “Lent – Commission and Omission”. We should all remember, that everyone is extremely important in God’s eyes, and everyone has been given gifts of time, talent and treasure that can be shared with God’s people. We use our gifts and talents to serve our family, friends, neighbors, parish and community. By the washing of the feet, Jesus taught us how to serve each other. Pray about your God-given gifts, use them and encourage others to use their gifts as well. Please consider getting involved in the next session of Generations of Faith in the future. View more photos from the event here .